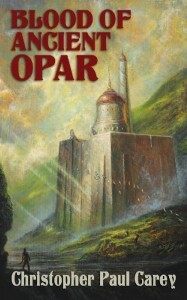 Featuring cover art and a frontispiece by Hugo Award-winning artist Bob Eggleton, Blood of Ancient Opar is immediately available for preorder in both a $27 signed limited hardcover edition and a $16 signed limited trade paperback edition. Blood of Ancient Opar will debut at PulpFest 2016/FarmerCon XI, July 21–24 2016, in Columbus, OH. At PulpFest/FarmerCon, Mr. Carey will sign the complete limited edition run of hardcovers and softcovers. All preordered books will ship to customers in early August 2016. As with all of our Signed Limited Edition Novellas, your name will appear on the acknowledgments page in the same order you preorder—as long as you preorder by June 15th 2016. Also note, the print run will be determined by the number of preorders received. Not many copies beyond those reserved will be printed, another reason to get your order in today!